← How much electricity do we really need? Which is the most environmentally friendly way to cook pasta? The first experiment was simply to compare energy supply requirements, and related GHG emissions, resulting from getting the water to boil on an electric or gas stove top. 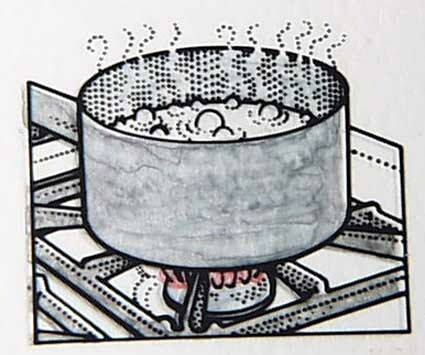 From a “controlled scientific experiment” perspective, the easiest way to carry out this test is by heating a fixed quantity of water from a specific temperature to boiling on both forms of stoves, using similar pots and similar burner/element sizes, and calculating the energy required. The results were not overwhelmingly in favour of either, but the gas stove won out. It was the most energy efficient as well as more kind to the environment. This was expected due to the fact that burning gas of course emits significantly less GHG emissions than coal*. iv) fill the kettle from the hot tap, boil, and then transfer to the stove. I have always guessed that the most energy efficient would be to first to fill the kettle with water from my hot water tap, and then once boiling, transfer to my pot. By using this method, energy is transferred to the water by three different appliances, namely the geyser, kettle and stove in order of efficiency. Of the three, your geyser is the most efficient in heating water since the element is in direct contact with the water, and the cylinder is relatively well insulated. A kettle on the other hand, also has a submerged element however it is not nearly as well insulated. Both are more efficient than the stove, regardless of type, since there are far more energy losses. After some testing and a couple of complex calculations, the somewhat surprising winner emerged. Finding 1: if you have a gas stove the most environmentally friendly method is to boil directly from the cold water tap. I found this to be astounding. This is mainly due to the very dirty nature of coal. I need to highlight here that I am specifically referring to GHG emissions, and NOT energy efficiency. It would be more EFFICIENT, to boil cold water first in a kettle and then put it on the stove, but the GHG arising from using my electric kettle made it more harmful. Finding 2: if you have an electric stove, then its best to first boil in a kettle, filled from the COLD tap, and then transfer to the stove. This was another surprising result, but this is due to the losses associated with filling your plumbing between the geyser and hot tap with hot water that will ultimately just go to waste. In summary, if you have a gas stove, fill the pasta pot from the cold tap and boil directly on the stove. If you have an electric stove, fill the kettle with cold water and then transfer to the pasta pot once boiled in the kettle. And there you have it – the most environmentally friendly way to cook pasta on a stove-top! *note: this is based on the GHG emissions arising from burning one or the other fuel to get a certain energy output, and doesn’t necessarily take into account the energy over the entire life cycle to get the bottle of compressed LPG to your stove. This entry was posted in carbon footprint, Energy, Product Observatory, Sustainable living and tagged Energy, Energy Efficiency, Sustainability. Bookmark the permalink.